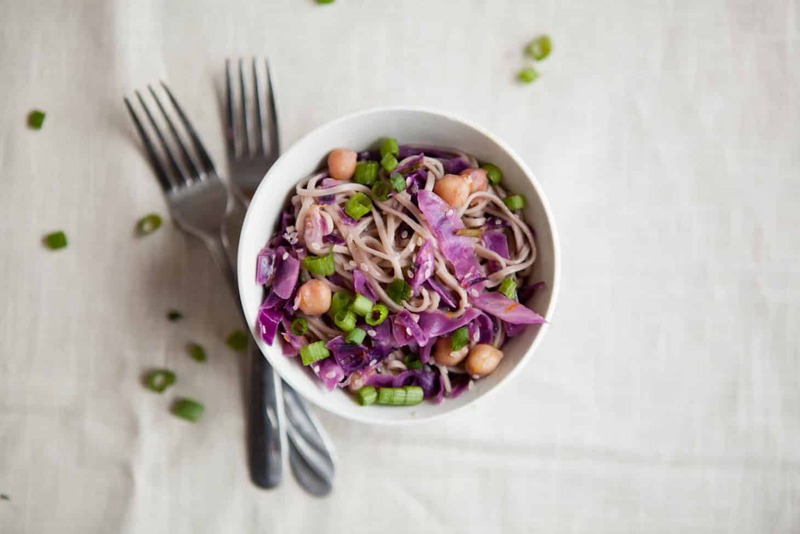 Sesame Orange Chickpeas, Cabbage, and Soba Noodles | Naturally. 1. I stand in the grocery store staring at bananas for what seems like hours (when really it’s probably only 5 minutes) while I try and decide which bunch is the perfect size and ripeness. 3. I still stick my tongue out when it snows. 6. I still go to the park and swing. 9. I work best in chaotic places (like coffee shops) even though I end up people watching the majority of the time. For this week’s actual recipe click over to Dominica’s Blog and for everyone else’s take, head over to the Food Matters Project website! In a large skillet heat olive oil over medium heat. Add in onions and cabbage. Let cook until until cabbage begins to soften. Stir in garbanzo beans, zest, sesame seeds, soy sauce, juice, and honey. Continue to cook until beans are warm and the liquids has cooked down a bit. Combine the noodles and the veggies. Serve with a sprinkle of green onion and a little extra soy sauce! This sounds delightful! Especially the sesame-orange combination. Yum! Two of my favorite past times are the orange and sesame Asian dishes! Combined I love them even more! Oh man I love bowl meals like this. Such an awesome combination of flavours too! Thanks. Yum! It’s a delicate vegetarian meal. Easy to make! Your dish turned out so colorful – it looks fantastic! This looks delicious! 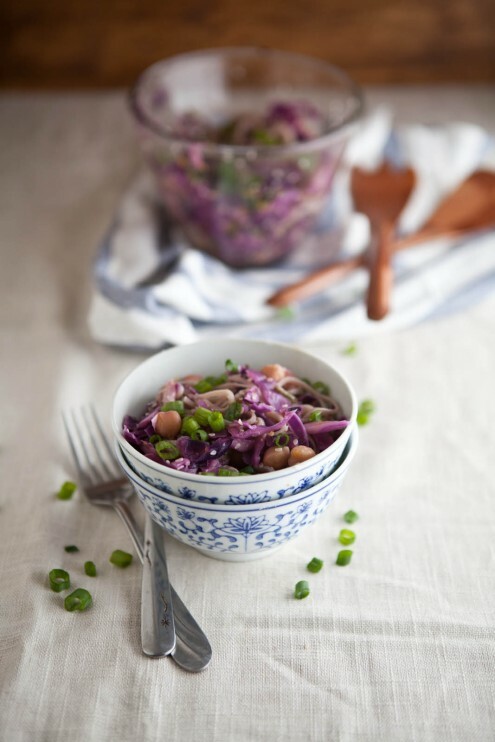 It’s probably even easier than the original recipe and I love how it uses even easier to find ingredients like chickpeas and cabbage. For some reason, I never think to add beans to stir fries but it’s SUCH a great idea! Love what you’ve done here. I tried to buy a coffee shop this summer (while trying to finish my Master’s in music education.) My parents were supportive but I know that they thought I was crazy! This dish looks delicious. I honestly have not bought soba noodles yet and need to – this will be the perfect reason! Is it weird that 7 out of your 10 random facts are true for me also? Another random fact about me: I have a strong weakness for boxed macaroni and cheese that continuously threatens to dismantle my usual intake of unprocessed, healthy foods. Annie’s Shells and White Cheddar will be the death of me! I grew up on boxed macaroni! However, I’ve managed to ween myself off and now I’ve love my homemade just as much! I love how colorful this dish is! I feel the same way about grapefruits, as you do about oranges! Love your take on this week’s recipe. I was out of town all weekend and didn’t get a chance to make it, but I’d be so content with a bowl of your soba noodes. I do the bAnana thing at the store with pretty much all produce, love swings, love being a creeper and watch people in busy places – it is highly amusing to me, and I always make my boyfriend peel oranges for me. PS I like the garbanzo bean idea! Man, wish I could think more creatively like you. Soba noodles… Yum! I have been so in love with noodles lately – soba and udon to be specific. 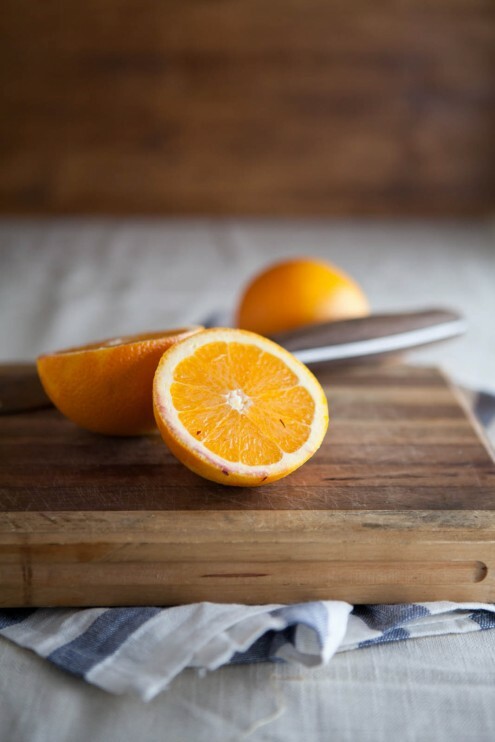 This sounds like a perfect zesty, sweet, warm, and a bit crunchy! I’ve found I love using noodles because you can really toss anything into a bowl and call it good! Reason numero uno why Daniel refuses to ever go to the supermarket with me again: I spend an ungodly amount of time in the produce section. Hehe. It’s a good place to be! I always someone to go to the store with me and then when they did, I realized how much I like shopping alone! 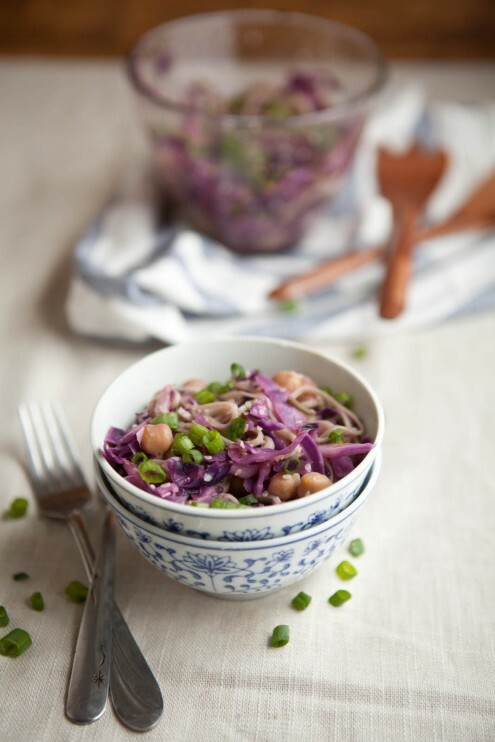 I almost went this route using edamame, but really like the idea of chickpeas. They are one of my favorite beans. 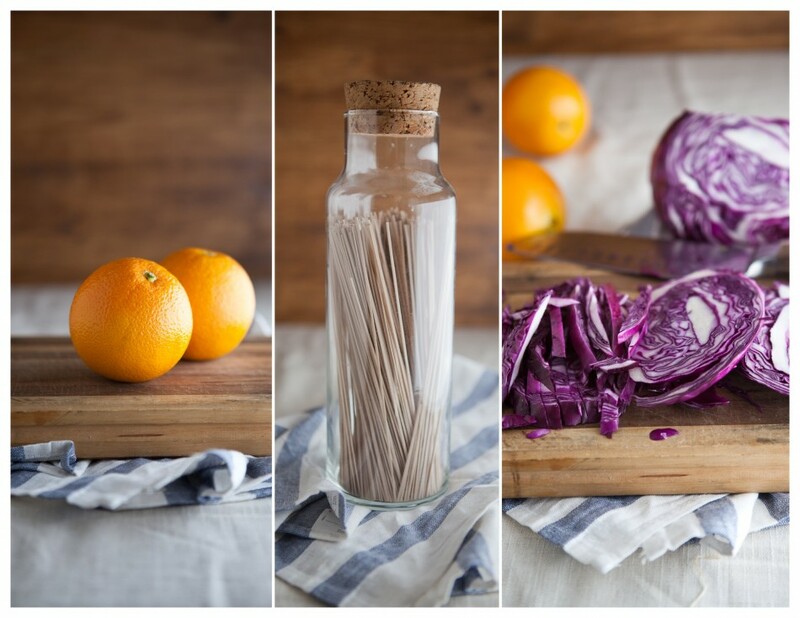 Great pictures too, love the color the red cabbage brings in. I looove your take on the recipe. I think my 3-year-old might love it too. I’m gonna try it for sure, maybe this weekend even. Beautiful pix too! Haha, I love your #1 – I’m the same! There are so many factors to choosing the perfect bunch of bananas. Or at least I think so 😀 Beautiful salad! The purple cabbage is so pretty(plus I love how it tastes) and the orange dressing sounds delicious. I love riding the train and I love the look and sound of this little soba noodle bowl. I *still* walk down the sidewalk avoiding stepping on the lines and cracks. And I love the smell of a fireplace. Good one- sometimes I’ll even say the rhyme from grade school about stepping on cracks! Sounds so yummy and looks so colourful! My random fact: I wanted to be a cowgirl. A relevant fact: Your pictures of this great dish are gorgeous, Erin! What an incredible recipe….your pics are amazing. I made this over the weekend and it was a huge hit. Tastes good next day and thereafter as long as you aren’t too turned off by bright purple chickpeas. I served it alongside some roasted root vegetables and I think it both looked and tasted great with sweet potato. Thanks! I wonder about using grapefruit for the citrus. I went looking for inspiration for my dinner tonight, and this I have found!! No cabbage so putting in raw red and yellow bell peppers. Also ran out of soba noodles already and no time to go out, over rice it is! This looks delishious and perfect for a girl like me on the go. Random fact: My favorite place to be is the grocery store. I have to restrain myself from asking my spouse if we can go “just because”. He knows I love it but would think I am a loony for wanting to go there.